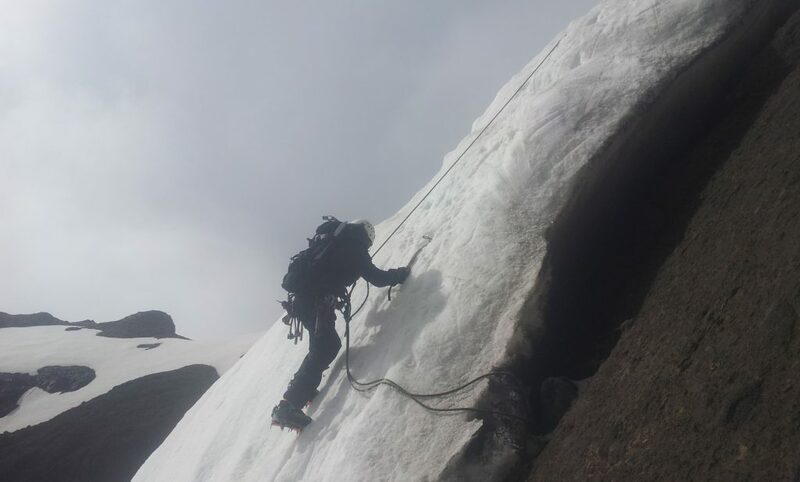 For my first attempt on Chimborazo I had zero mountaineering experience; my first use of crampons was a short training session on the Stübel glacier a couple of days before. Being the closest point on Earth to the Sun (6310m) I wondered whether this was a little ambitious but convinced myself that it would be OK, after all I’d manage to cycle from Alaska hadn’t I? After a few short hours sleep most start out for the peak at around 10pm from the refuge hut (4800m). Wanting the most exceptional experience possible, I thought it would be more memorable to camp higher and start out from there. This didn’t turn out to be such a great idea. For alpine ascents the norm is to climb during the night since the freezing temperatures mean there is less risk of rock and ice fall. We arrived at the 5350m camp just before El Castillo after climbing the ridge late afternoon and soon went to bed planning to get up and leave by 1am. I couldn’t sleep a second due to breathing difficulties, gasping for air a few times every minute. Something I hadn’t expected. Why did this happen? My understanding is that your lungs primarily regulate their breathing by using the carbon dioxide level in the body as a trigger. This is fine at normal altitude levels, however at high altitude deeper breathing is required due to the low oxygen levels in the air. This deep breathing results in consistently low carbon dioxide levels in the blood and so carbon dioxide ceases to become a good indicator of when to breathe. The level of oxygen in the blood becomes a more critical factor so the trigger for breathing changes. Since the ‘monitor’ in the body is less sensitive to its oxygen level breathing can be somewhat delayed resulting in an uncomfortable gasping for air. This and my accelerated heart rate kept me from sleeping. (Note this is my understanding, I’m not a scientist though so it might not be exactly right). I was already tired and nauseous as we roped up and headed across ‘El Corredor’ with its loose rocks and steep drops at one in the morning. 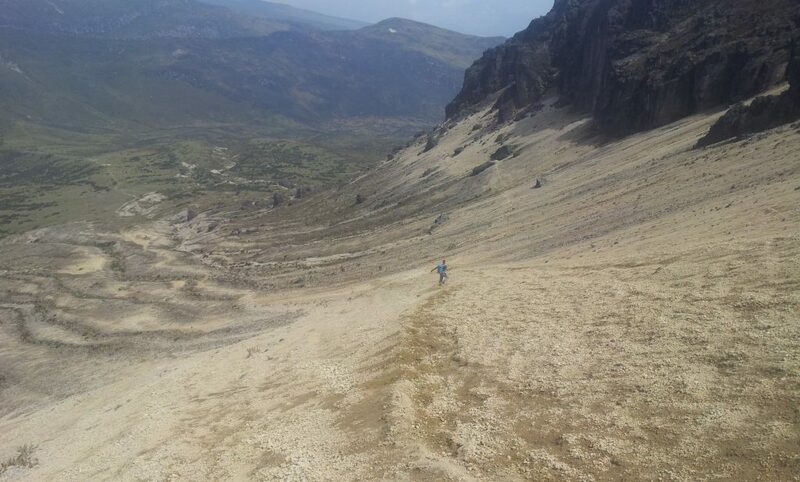 (El Corredor translates to ‘the runner’ (I believe) as risk of rock fall means this is no place to hang about.) 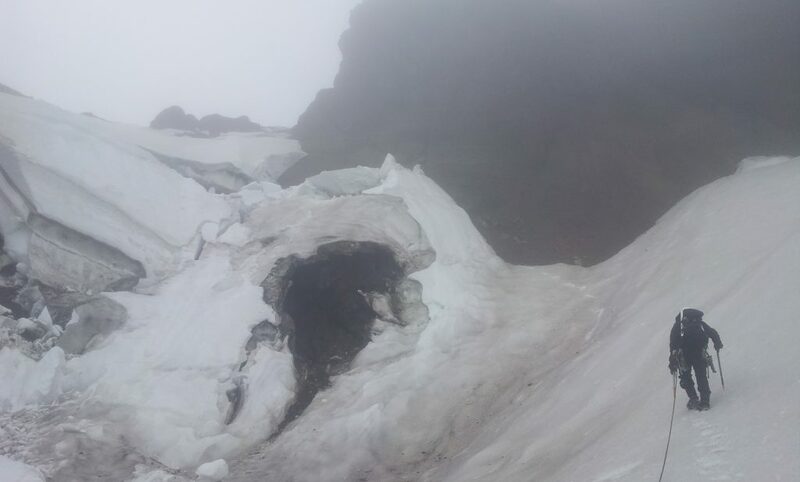 Once we passed El Castillo we hit the ridge again, put on our crampons and scrambled up the rocky outcrops towards the glacier; a fall here wouldn’t have been good. With increasing nausea I started to wonder if I’d start vomiting, not very enjoyable. I could see the icy slopes stretching off into the stars and couldn’t imagine how crap I’d feel if I managed to climb another 700 metres. I wasn’t too disappointed when we decided that the conditions on the glacier were too bad to continue up; the ice was very uneven and hard. Self arrest would have been difficult in these conditions and the slope inconveniently ends in a big cliff. Turning around was a prudent decision; multiple gravestones above the 4800m refuge hut serve as a reminder to the dangers on this mountain. On the way down we took a moment by El Castillo and looked up at the lights of the other mountaineers on the glacier. With full moon out, it was quite a sight and somewhat surreal as we watched people trying to find a safe route up (most people turned round eventually). What a place to be at night. 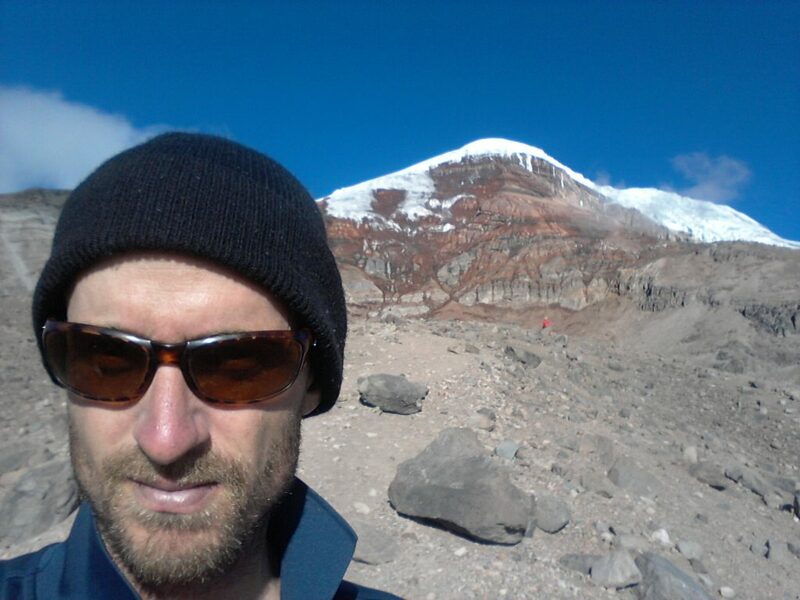 Acclimatising for Chimborazo. Taken near-ish to the refuge hut. Obviously disappointed not to make it to the top I decided that I would return for another attempt after acclimatising and training on a few other mountains. And so I headed up north to first climb the relatively easy Iliniza Norte. 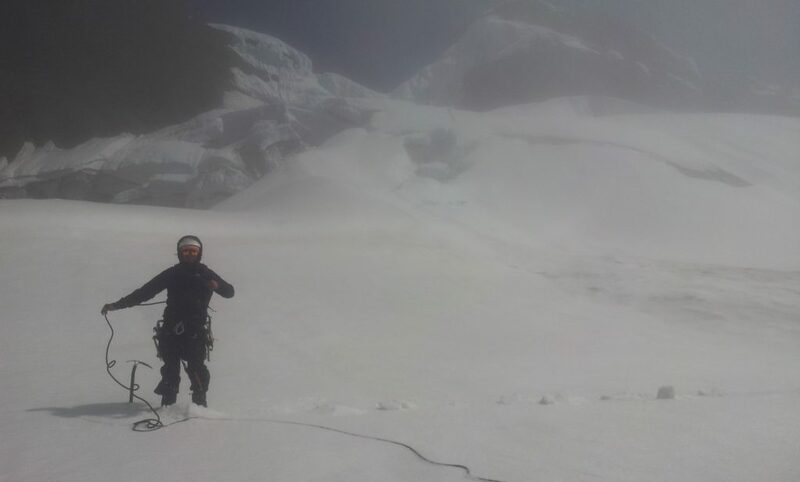 Then, since Cotopaxi was closed due to volcanic activity, Cayambe was the next obvious option to develop my crampon and ice axe skills. It was fairly straightforward except for the last section where one of the guides had to open a new route to the summit and delayed us by a couple of hours. There was an immensely disappointing moment where we thought we were going to have to turn round. Poko, my enthusiastic and able guide. 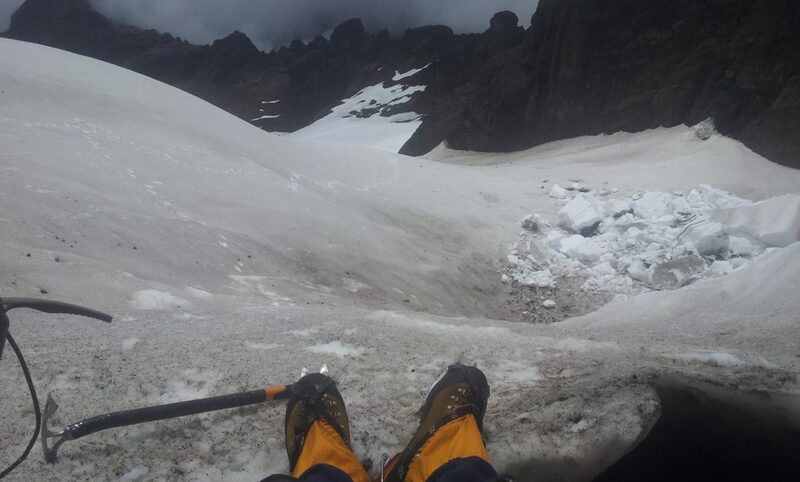 I was back in Chimborazo a week later; it had just snowed which meant we could safely head up the normal route via the second refuge hut (5000m) and El Corredor (instead of la arrista / ridge). We camped outside the Carrel refuge at 4800m and headed off at 11pm. 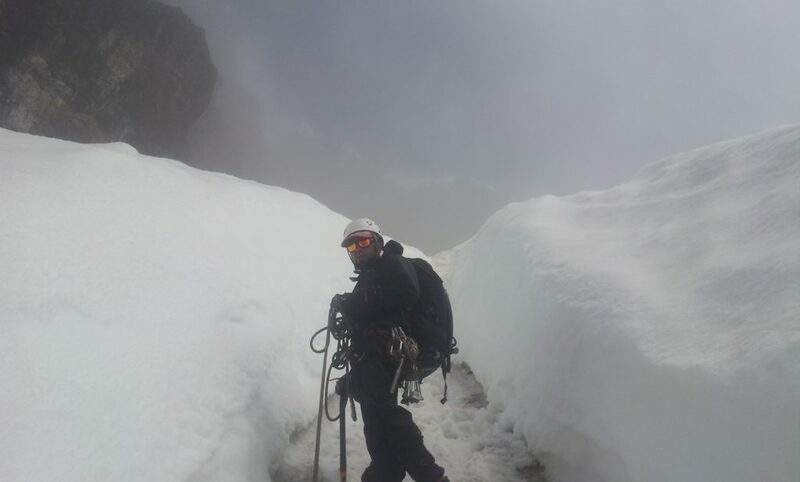 After many long hours on the steep icy 50 degree glacier we arrived on the first (false) summit Veintimilla. It was about 6.20am. You think you’re there but you’re not. Most people get turned round here by their guides here since the stretch to the main Whymper summit can take an hour or two and can be quite arduous under certain conditions. I wonder if the guides can’t be bothered sometimes but maybe that’s not fair. (It’s worth being clear beforehand that you really want to get to the top summit). 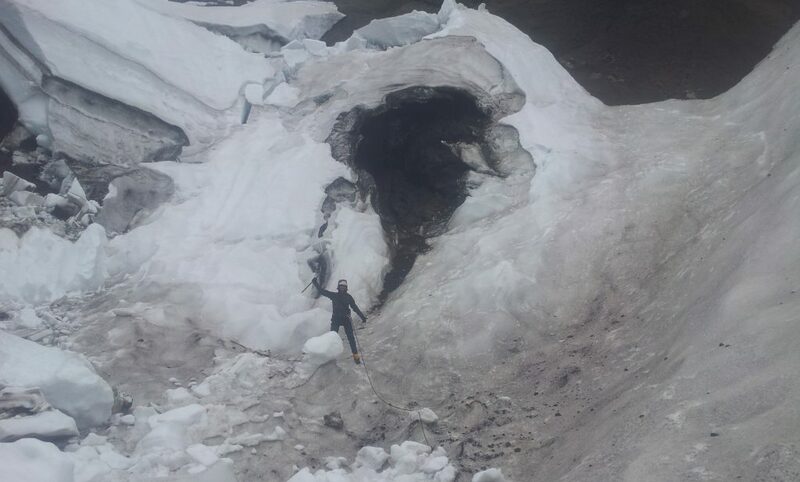 You can see the top and it seems so close but it took us until 8am to get there, navigating through the 5 metre high snow and ice channels (penitentes). Nausea and tiredness had started to kick in; I think I should have eaten more (but I had no appetite). I must admit part of me I was secretly hoping Santiago would turn us around! 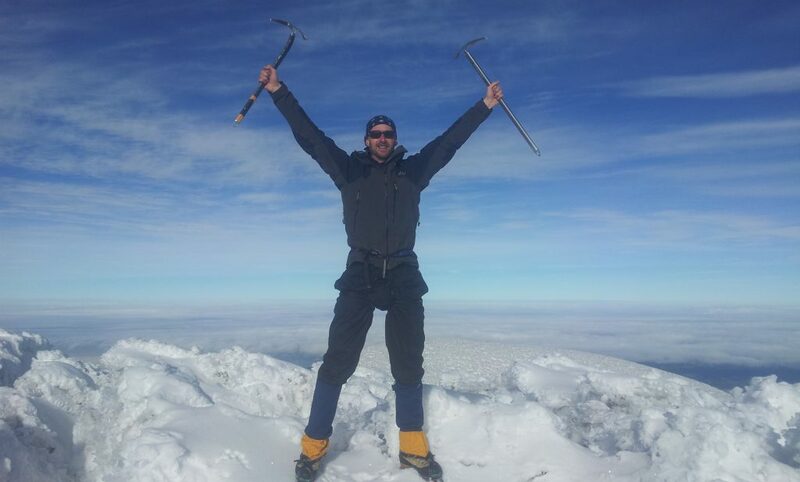 It was a great feeling to be on the summit. Heading back down the ice channels sweating with all my layers on and the sun up was tough. (Changing clothes is time consuming with the harness and crampons on so one has to be quite selective as to when to do it). It was also mentally difficult having to climb back up to the Veintimilla summit first before I could go down when I knew that I needed to lose altitude to start feeling better. But it was a great feeling to have made it. El Altar was next and involved a day of travel and hiking to get to the basecamp. We bumped into Davicho and Vidda who had just tried to climb Obispo (the highest peak of the huge El Altar crater) with Davicho having a nasty fall due to very poor loose rock conditions high up. We decided to climb to its ridge for training purposes (instead risking a summit). The next night we traversed across to Monja and climbed it’s steep icy slopes getting to within 200m of the summit. 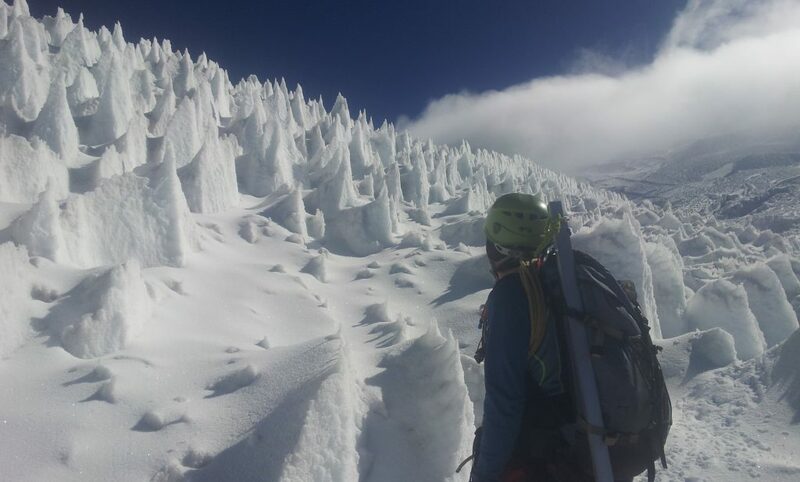 Unfortunately the state of the snow was unstable and was too dangerous to climb to the peak. I can only imagine what the final section would have been like with the 1km drop. Still, we managed several 50 metre ice pitches. It was exhausting traversing back to camp with the sun beating down through the misty cloud after 12+ hours. Waiting for Santiago to set up the pitches so I could climb safely. 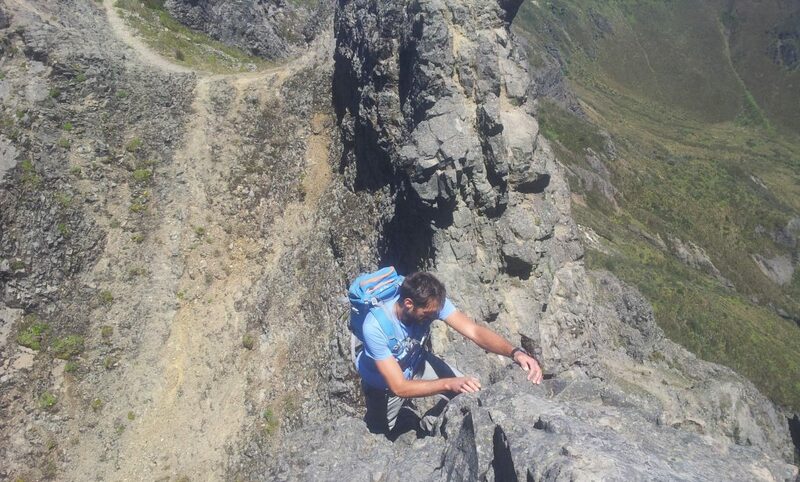 Coming down from an aborted attempt on Monja peak the next day. These steep ice channels required concentration. The actual crater of El Altar with 1km high cliffs that drop down into its impressive yellow lake, quite a sight. Most of the peaks are climbed from the other side where they are more accessible. The peaks are named after clergy with Obispo being the highest. There are endless climbing opportunities here. 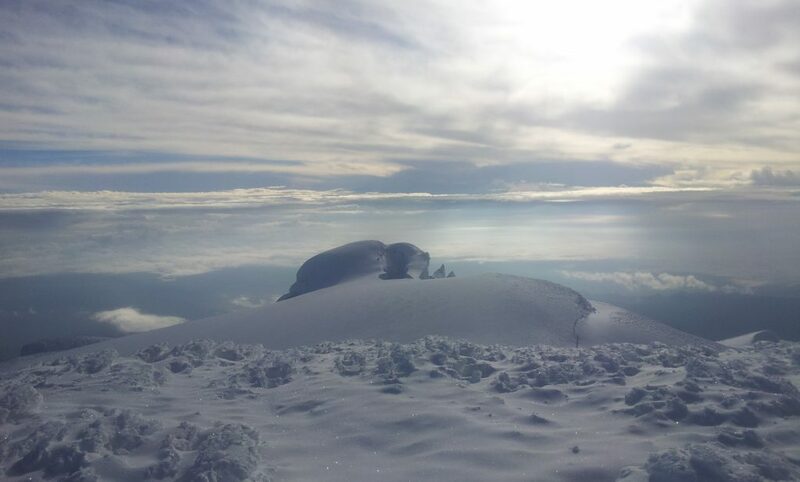 Finally I climbed Rucu Pichincha (Quito) via the Paso de La Muerte ridge with Vidda Denis. The ridge was reasonably easy to climb but one or two sections required the utmost concentration with significant drops. Another day Vidda and I went on to Guagua Pichincha which is the on the other side; it required no equipment. From the teleferico to the summit and back, we took around 5 hours semi-running. On the return we came back up via the cliffs on the west to Rucu which had some some steep drop offs. Paso de la muerte on the way up to Rucu Pichincha – utmost concentration required here. 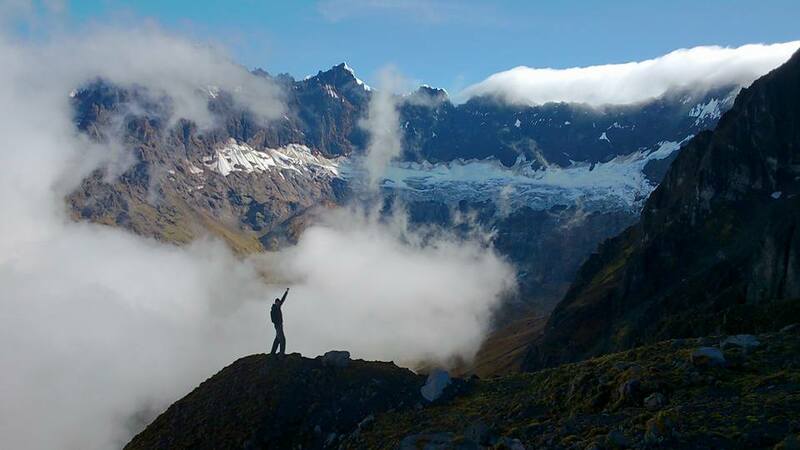 TIPS: In Ecuador, you can directly hire a fully qualified guide for US$100 per day. This is a lot cheaper than going through an agency although you need to organise food, kit and pay for taxis / transport. 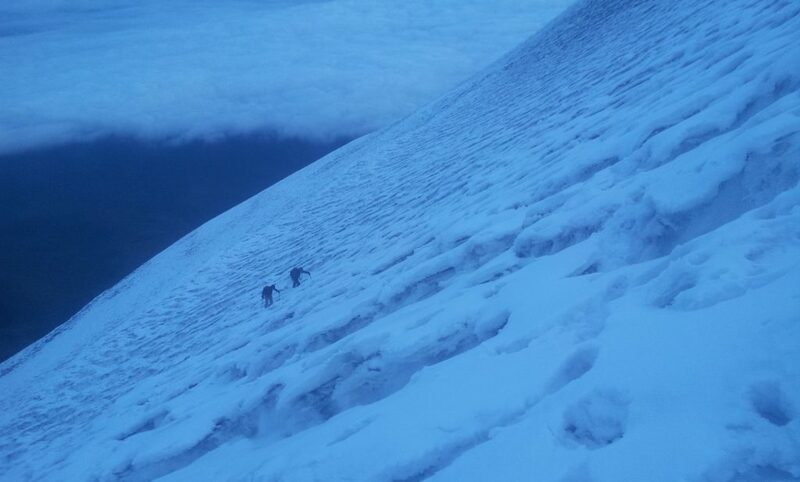 Chimborazo takes two days so the guide will cost you $200 which can be split if you bring a friend. I chose to go alone with my guide to maximise my chances of summiting. For a technical mountain like El Altar the guide will only take one person. It was $25 to $30 to get a taxi to the 4800m refuge from town but you may like to hike up from the park gate to help with acclimatising. Camping outside the hut was fine. Santiago Naveda and Poko Silva were both excellent guides. Please let me know if you would like further recommendations or need other information. ← Maximum Impact – Carbon Offsetting – is it just b.s.? 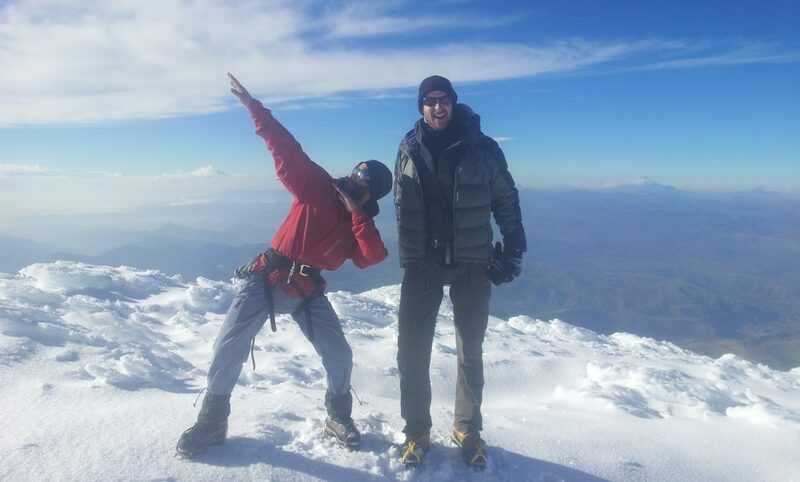 Which agency did you book with to climb Chimborazo and what was the name of the guide?